It is with great sadness that we announce the passing of former DRA board member and Vice President Cam Groner on July 17, 2017. Cam died quietly and peacefully at the end of a many months-long battle with Creutzfeld-Jakob Disease. Cam is deeply missed by those close to him. He was incredibly bright, sometimes irascible, strong-willed (some might even say stubborn), and nearly always right. A subversive sense of humor kept Cam from allowing any situation to become too serious. Cam could readily quote from memory Shakespeare, the law, Firesign Theater, song lyrics, and nearly anything else that he had been exposed to at some point in his life. This made him an entertaining delight to spend time with. Cam was the consummate fly-angler. The real deal. The kind of fisherman whose life was centered around and focused on his passion for fishing. The man could fish. He took huge pleasure in every aspect of it. He was a pleasure to fish with because his joy in fishing was so intense and so contagious. Cam especially loved fishing for steelhead. Later in life, he traveled to the Dean River in British Columbia as often as he could. He loved the wildness of the place, and the run of huge steelhead there. But most of all Cam loved the lower Deschutes River. So much so that he and his partner, Ingrid Brydolf, built a second home in Maupin. It was from there that Cam could fish and entertain friends. Cam didn’t fish much with guides, but when he did he loved to fish the waters of the Deschutes River along the Warm Springs Reservation with his friends Al Bagley and Matt Mendes. Here’s a video where Cam produces an opera, the Hardy Reel Opera, with Matt in the background. Cam loved to hear that reel sing. Cam did his undergraduate studies at Yale, acquired a master’s degree from Harvard, and went on to graduate from Northwestern School of Law at Lewis and Clark College. Cam retired as the Chief Legal Officer for Legacy Health. His retirement career was as the first director of the DRA legal team and Vice President of the DRA Board of Directors. Cam was also a member of the DRA Founding Circle. The rivers and fish that Cam loved benefited greatly from his advocacy and extensive legal background. In his time with the DRA, Cam worked diligently driving processes to find resolutions to the problems facing the lower Deschutes River. Cam will be missed most of all by his children Christine, Lauren and Geoff, his life partner Ingrid Brydolf, and his best friend and fishing partner Dave Baca. Our heartfelt condolences go to them, and to everyone else who knew and loved Cam. Memorial contributions can be made to the Cam Groner Memorial Fund at the Deschutes River Alliance. Please note on your contribution that it is for the Cam Groner Memorial Fund. All proceeds donated in Cam’s memory will go towards the DRA’s legal expenses. Contributions can also be made to the Legacy Health Foundation’s Cam Groner Charity Care Fund. You may also honor Cam by going fishing, and at the end of the day toasting a glass of good Oregon pinot noir to his life and his memory. We’ve received several inquiries lately on the status of the DRA’s ongoing lawsuit against Portland General Electric. Since our last update, there have been some developments in the case. First, a brief recap. Last August, the DRA filed a Clean Water Act “citizen suit” against PGE, alleging hundreds of violations of the water quality certification for the Pelton Round Butte Hydroelectric Project. These violations are directly related to the Project’s installation and operation, since 2010, of a Selective Water Withdrawal facility above Round Butte Dam. The Project’s water quality certification (known as a Clean Water Act “Section 401 Certification”), issued by the Oregon Department of Environmental Quality, contains several requirements for criteria such as pH, temperature, and dissolved oxygen. These requirements were formulated to ensure the Project complies with Oregon’s water quality standards. These water quality standards, in turn, are designed to protect aquatic life in Oregon’s waters. Since the SWW tower came online, DRA researchers and supporters have witnessed a dramatic decline in ecological function in the lower river. Algae on rocks, one mile below the Pelton-Round Butte Reregulating Dam. Soon after the DRA filed suit, PGE filed a motion to dismiss the case, arguing that the Clean Water Act does not authorize citizen groups like the DRA to enforce the requirements found in Section 401 Certifications. PGE argued further that water quality enforcement authority at hydroelectric projects should be given exclusively to the Federal Energy Regulatory Commission (“FERC”), a federal agency with no water quality expertise. Given that the CWA unmistakably authorizes enforcement by citizens (and local state agencies) in these situations, we strongly resisted PGE’s arguments. In March, after extensive briefing and oral argument, Federal District Court Judge Michael Simon issued an important ruling–important not only for our fight to restore the Deschutes River, but also for river advocates across the country. Judge Simon found that the DRA’s lawsuit—and, by extension, other, similar suits involving hydroelectric projects—are clearly authorized under the Clean Water Act. In fact, according to the federal judge, such an interpretation is “the only construction that is consistent with the text of the [Clean Water Act] and the purpose and policy of the CWA.” This ruling allowed the DRA’s suit to proceed—fantastic news for those who cherish a healthy ecosystem and clean, cold water in the lower Deschutes River. We believe Judge Simon’s decision ultimately will enable us to present evidence, as necessary, of PGE’s violations. Lower Deschutes River Redband trout. Photo by Brian O’Keefe. This brings us to the current status of the litigation. Despite the fact that Judge Simon’s well-reasoned, detailed analysis was based on a straightforward reading of the law, PGE has filed a petition asking the Ninth Circuit Court of Appeals to hear an appeal of Judge Simon’s ruling. In response to this request for appeal, the DRA has now filed two briefs with the Ninth Circuit, arguing forcefully that there is no reason for the Court to hear the appeal, given the Clean Water Act’s clear, unambiguous language on this point. We are now waiting for a decision on whether the Ninth Circuit will hear PGE’s appeal. The Confederated Tribes of the Warm Spring Reservation, a co-owner of the Project, have filed a brief aligning themselves with PGE on the issue of citizens’ enforcement authority. Meanwhile, the states of Oregon and Washington have filed a joint brief on behalf of the DRA. This issue has great significance for water quality in the lower Deschutes River, and for rivers across the country that are impacted by hydroelectric projects. In PGE’s telling, water quality enforcement authority should not be vested in the citizens and the state agencies who are most knowledgeable, engaged, and invested in water quality. Instead, PGE argues this authority resides exclusively in a federal agency with little interest or expertise in enforcement of water quality law. While perhaps this result would be desirable for PGE and other dam operators across the country, it is certainly not the result intended under the Clean Water Act, which explicitly authorizes citizens to bring lawsuits in just this type of situation. The Clean Water Act citizen suit provision is an essential tool allowing citizens to secure compliance with critical water quality standards. The DRA will do whatever it takes to protect this important enforcement tool–and to restore clean, cold water and a healthy aquatic ecosystem to our beloved lower Deschutes River. Keep an eye on the blog for more updates as they develop! We’d like to take this opportunity to extend our gratitude to an organization that has provided incredible support for the DRA’s work over the last few years. This spring, for the second time, the DRA was selected by the Flyfisher Foundation to be the recipient of funds raised during the Keith Hansen Memorial Paddle Raise, which took place in May at The Flyfisher’s Club of Oregon’s annual auction. This fantastic event raised over $23,000 for the DRA’s 2017 science and advocacy efforts, bringing the total amount awarded by FFF to the DRA to nearly $50,000 over the last three years. We have been truly honored to partner with FCO and FFF as we work to protect and restore the lower Deschutes River. These organizations were founded to promote and preserve the art, science and history of the sport of fly fishing. To that end, they have provided funds annually to organizations undertaking important work to protect and restore rivers that provide invaluable fly fishing opportunities for generations to come. 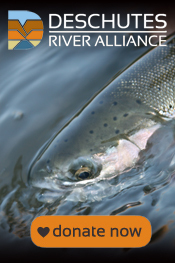 Previous grantees have included Western Rivers Conservancy, Pacific Rivers Council, and the Native Fish Society. It has been a privilege for all of us at the DRA to be part of this lengthy tradition of working with FFF to protect treasured western rivers. The generous assistance of the Flyfisher’s Club and the Flyfisher Foundation will be critical to all of the DRA’s efforts in the coming year. We’ll continue to put these funds directly to work to restore cooler, cleaner water to the lower Deschutes River.